Windmills have a charming quality about them. They can be used a decoration for your landscape or they can be functional. Today, they are regaining popularity and they are lining country sides more and more. Some are even used to provide energy. Here is how you can build a windmill. Read on to find out more. Mix of bolts, gears, nuts and axles. The American windmill style. 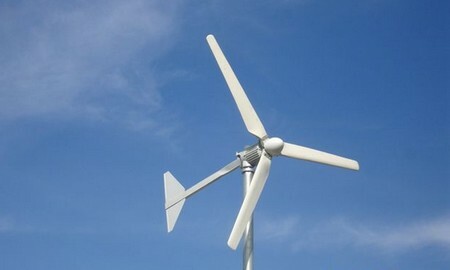 The metal “fantail” behind the blades turns the assembly into the wind. Choose the type of windmill you want to build. There are Dutch and American Windmills that have blades that are also called sails. These sails rotate to catch the wind from whatever direction it may be blowing in. There are also fixed Windmills. These are positioned in places where the wind blows mainly from one direction. These have stationary arms. Fixed windmill style. This has the traingle sails fixed to the arms during the time when the mill is busy. Decide where the location for your windmill will be. You will need great exposure to wind. The type of space you will need depends on the kind of windmill you choose. An American Windmill will need vertical space. There needs to me no overhead obstruction like electric lines or trees. A Dutch Windmill rotates and needs space all around it. A Fixed Windmill style has to accommodate the arms. The Beebe Windmill head assemly. Make your Windmill out of stone, metal, brick or wood. The head assembly is the most important part. American Windmills are pretty compact today. Depending on your Windmill, the parts can be placed on so the sails are postitioned on the axle that operates the gear that in turn operates the mill. You can find steel and refurbished head assemblies at a reasonable price online. Build your Windmill to satisfy your needs. It is suggested that you use solid steel blades for American farm windmills. Add bigger sails of canvas over the wooden blades for a bigger Fixed and Tradition Windmill. Some traditional lattice designed sails are from northern Europe. The Dutch Windmills and the fixed Spanish Don Quixote version are very popular and recognizable. Tilt the sails of your windmill slightly to catch the wind you need to move the head assembly. You’ll only need a lattice or arm for Windmills that are decorative. If you need help go to your local farm or home supply store. Make and put in a pump to aerate a pond for pumping water. Enjoy your new Windmill.